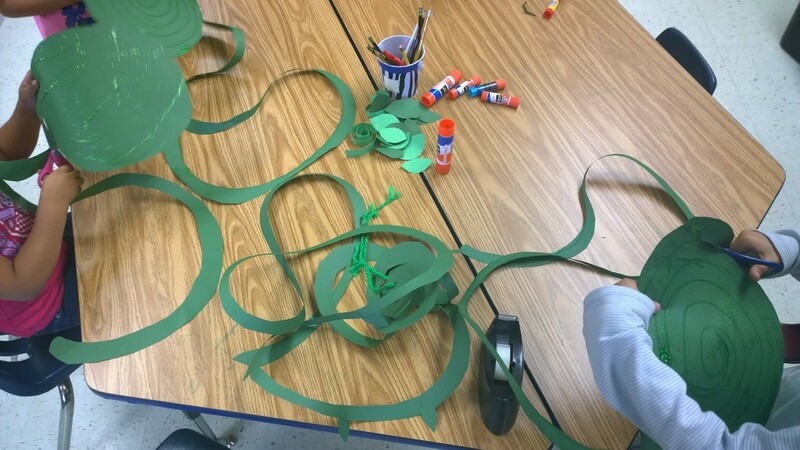 You are here: Home / Activities for Childrens Books / Jack and the Beanstalk Craft – Make Your Own Giant Beanstalk! It looks awesome – I can’t wait to try it with my class!! Thank you for the inspiration! You’re welcome! Glad you stopped by! this is exactly what I’ve been looking for! thanks for the idea! I’ve been looking at so many, but yours is the best and easiest to do. Thank you! So glad you like the project! This looks really great for a project I’m doing. One question…..what keeps the loops of yarn on all the individual bean stalks from just falling down the long piece of yarn to the floor? Hi Darci. On each individual beanstalk you should punch a hole and add a loop of yarn going through, the kind of loop like on a gift tag. Once you have all the individual beanstalks, gather them all together by their yarn loops, and thread another piece of string through all the individual loops and into a knot to to connect them. You can then hang them from the ceiling from the string that connects all the individual pieces. I hope that answers your question!